The dental hygienist plays an integral role in patient's oral health care here at Foxhall Dental Surgery in Ipswich. Their role is largely preventative, although some gum disease treatment may be administered by them too. Dental education for both adults and children takes up a significant portion of their work, enabling patients to have the knowledge and skills to take responsibility for their own oral health. Gum disease can become serious if untreated. A dental hygienist is trained to detect and treat early stage gum disease as well as performing routine cleaning such as the well-known “scale and polish”. This involves the removal of hardened plaque from the teeth which can no longer be removed by simple brushing and flossing. Once this plaque has been removed, you will be given advice about how best to keep your teeth healthy and your gums disease free. Along with the above, the dental hygienist is also trained in the taking of x-rays. These are then used by the dentist to detect any problems that may be happening underneath the gum where a general examination cannot detect them. In some cases, hygienists may also be able to apply fissure sealant or fluoride varnishes where this is necessary. Although a dental hygienist does not perform invasive dental procedure, the 'light touch' approach enables a patient to maintain their oral health care and keep their teeth in good condition without the need for invasive procedures. 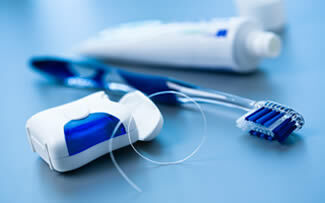 Hygienists will also be able to offer advice on flossing techniques as this, often undervalued process, is extremely important in keeping gums healthy. Because some people find flossing difficult, it is thought that only around a quarter of the UK population actually do it. If you are one of the 75% that don't, or, if you do and find it difficult, please discuss this with our hygienist who will only be too happy to help. As well as advising on brushing and flossing techniques, a dental hygienist may also discuss your diet with you, especially if you have a specific dental problem. Adjustments to your diet may be suggested to ensure ongoing optimal oral health. As smoking causes a dry mouth which is the perfect breeding ground for bacteria which cause gum disease, our hygienist will only be too happy to suggest ways and means of stopping smoking. This, of course, will have benefits for your overall health too. Children especially can benefit from visiting the hygienist at Foxhall Dental Surgery on a regular basis. Establishing good dental habits early on in life means that these habits are more likely to be continued throughout adulthood too. Our hygienist is particularly skilled in providing dental education and helping children get off to a good start with looking after their teeth and gums.